It’s already March, which means it is time to get into the garden! One of my greatest challenges when I first became a parent was to figure out how to garden with young children. At first, I tried to rush out during their naps and frantically weed, plant, and harvest. Then, I realized I was robbing my children of the incredible experience of learning about plants and growing their own food. Previously, I wrote about 10 Tips for Organic Gardening with Children. 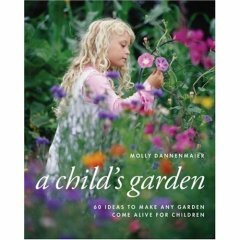 Recently, I discovered Molly Dannenmaier’s book A Child’s Garden: 60 Ideas to Make Any Garden Come Alive for Children. Wow, 60 ideas…that beats my ten! The photographs in A Child’s Garden are incredibly beautiful and inspiring! Featured in the photos are innovative examples of how to create special natural places for your children in the garden, such as mazes, paths, out-of-the-ordinary sandboxes, child-friendly ponds, peepholes, etc. A historical perspective is also included to contrast the disappearing of outdoor afternoons in modern children’s lives. “Long hours of unstructured outdoor exploration are a fast-vanishing aspect of contemporary childhood.” This is one reason I have chosen to raise my children in the rural mountains, where everyday is filled with outdoor fun; however, if you live in or near a city, your backyard can be transformed to a child friendly garden. The ideas contained in this book are very creative and inspiring. For example, it is suggested that children enjoy theme gardens, much the same way an adult will plant a medicinal or herb themed garden. Children also love theme gardens, especially when the subjects recall childhood stories, songs, lessons, or family lore. A Peter Rabbit garden planted with Mr. McGregor’s beets, radishes, and strawberries brings to life a story children have heard and seen illustrated in books but not replicated with living props…A Tinkerbell garden filled with tiny fairy flowers such as cowslip, foxglove, and creeping thyme can be planted and then sprinkled with corn starch “fairy dust” for good luck. Of course, I love the idea of connecting literature and gardening. A Child’s Garden is simply a beautiful and inspiring book. If you need a little encouragement to garden creatively with your children, this book will not let you down. Of course, make your family garden organic for your children’s and the planet’s health! Thank you for this informative post! I just found your blog and LOVE it.